NYPD officer Patrick Cassidy, who found the logs, has donated them to Liverpool's Magical Beatles Museum. 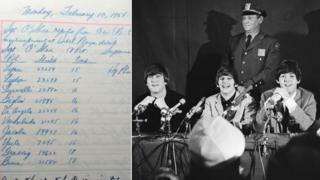 Detailed as the "visit of Beatles singing group", the handwritten police blotter lists Sergeants O'Shea, Jones and McAuliffe, with officers Delgado, De Angelo, Lucarelli and Madden among the NYPD detachment looking after the band. The records also mention The Beatles' show at Carnegie Hall on 12 February 1964 and an incident where an officer was "knocked off balance" and injured outside the Plaza Hotel while "attempting to restrain the surging crowd". Image caption The records refer to the arrival of the "Beatles singing group"
"The Ed Sullivan Theatre is in the confines of my precinct, so one day in 2013, I went into the storage area that holds these books. "After 50 years, they clean out and destroy them, so I looked up February '64 and found the book, which would have been destroyed the following year." Mr Cassidy said his father had told him he found The Beatles to be "well dressed and well behaved", adding that the band had modestly assumed "the crowds outside the hotel were for someone else". Throngs of screaming fans and reporters shadowed the band's every move, with police on alert for anyone posing as hotel guests or other disguises trying to get close to them.